Had the opportunity to partake in a food tasting session at Jia Wei (家 味), which literally means taste of home, courtesy of the folks from Grand Mercure's marketing department. 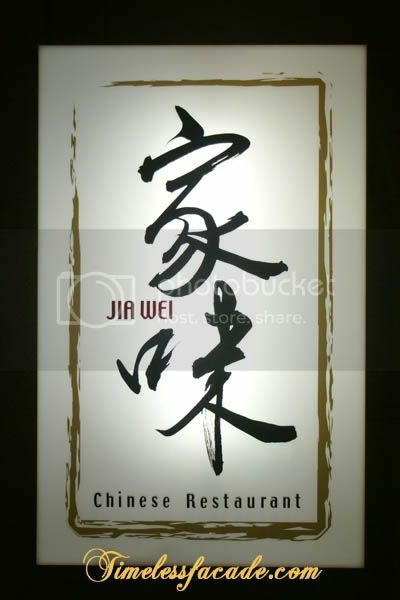 Opened in December 2007 and occupying the premises of the former Thai inspired Beads Restaurant, Jia Wei is helmed by Chef Lee Tuck Seng, who has over fourty years of culinary experience with several culinary awards under his belt. 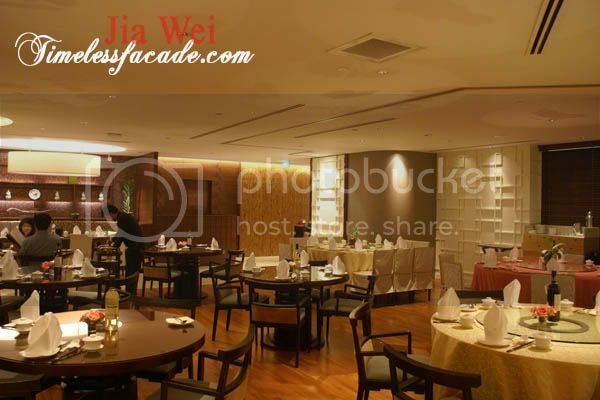 There is the option of taking the escalator or lift up to the second floor, where Jia Wei is situated. 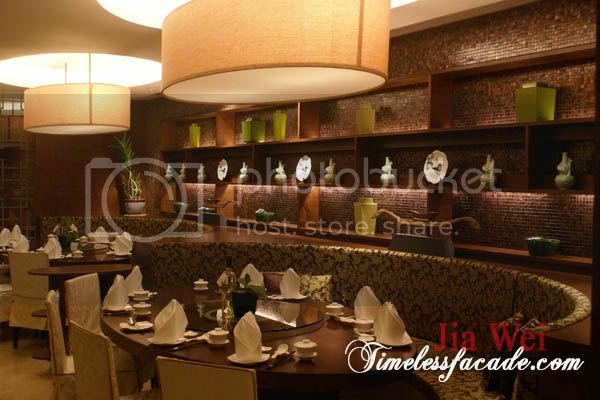 The restaurant's interior is reminiscent of a classical, not too elaborate Chinese restaurant with its round tables, parquet flooring, low ceilings and Chinese ornamental displays. 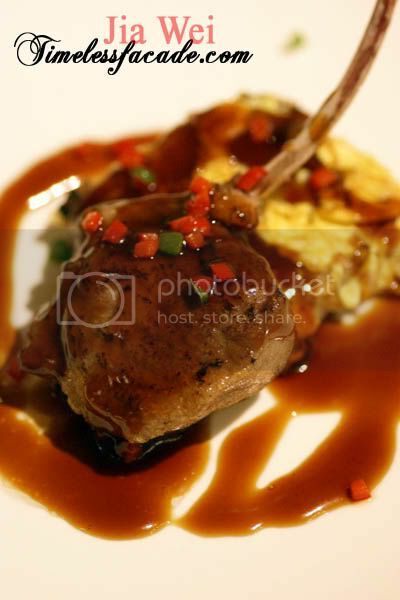 This dish wasn't on the Christmas menu that we were supposed to sample but no complaints about the extra food though. 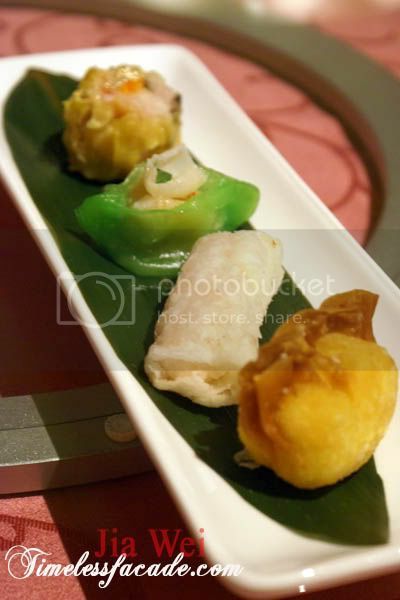 Personally I thought that the Siew Mai had too much fat meat in it which resulted in a rather strong pork taste that fell wayside of the fine and exquisite ones I've had at Royal China and the likes. 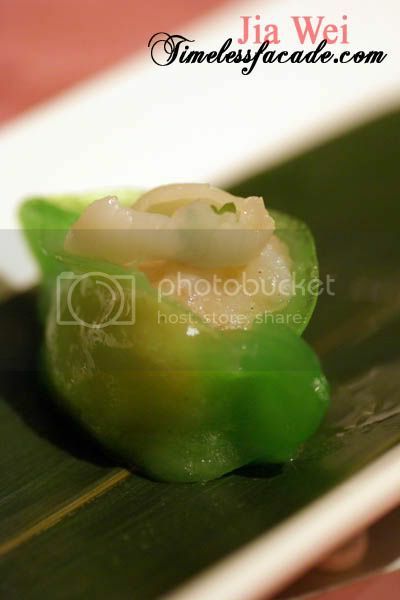 On the other hand, I appreciated the prawn and scallop dumpling which saw fresh and crunchy prawns enveloped in a translucent green skin and topped with a slice of savoury scallop. In the middle of the scale was the prawn and mango roll which carried a faint (too faint in fact) sourish tinge from the mango coupled with the fresh prawns. Its relatively thick skin discounted the experience quite a bit for me. As for the deep fried prawn wanton, it was comfort food. Fresh prawns wrapped in crackling wanton skin. Overall, a rather oily dish to kick start the dinner. No Christmas meal would be complete without turkey so the menu started off with a turkey appetiser, which is quite a surprise really, especially when you seldom see turkey in a Chinese restaurant's menu. Honestly, I found this dish rather lacklustre as compared to the one I had just a week ago at Braise. I know the preparation methods are different but comparisons are naturally inevitable. 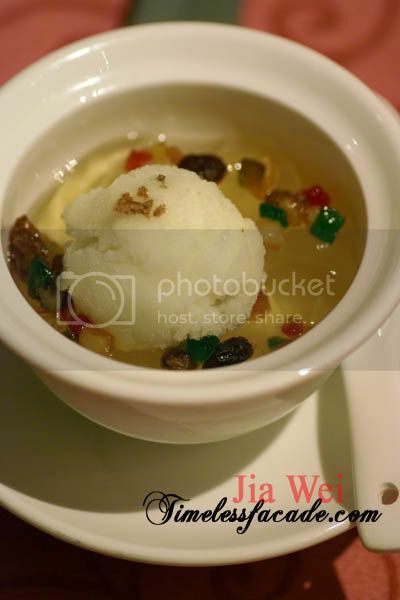 Jia Wei's offering was a little too dry and a tad too salty for my liking. 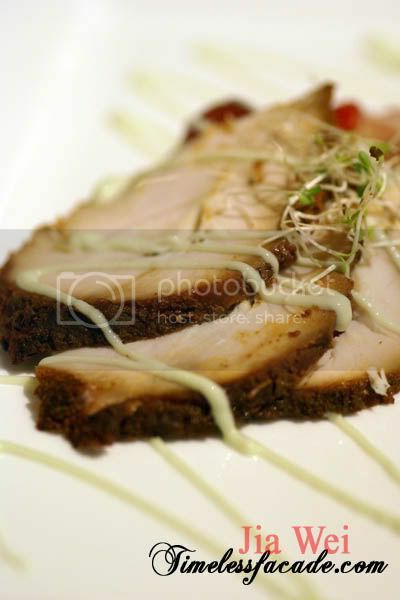 However, I must complement the idea of pairing the turkey up with wasabi sauce and fruits, creating a myriad of flavours - saltiness from the turkey, sweetness from the fruits and a touch of 呛. This is the second restaurant that I'm having shark's fin served in a hot stone pot, with the first being Taste Paradise. 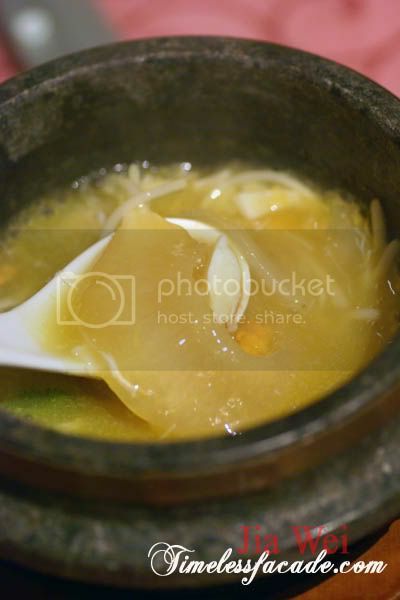 The purpose of serving soup in a stone pot is to keep the soup hot/warm for a much longer period of time, so as to maximize drinking pleasure. 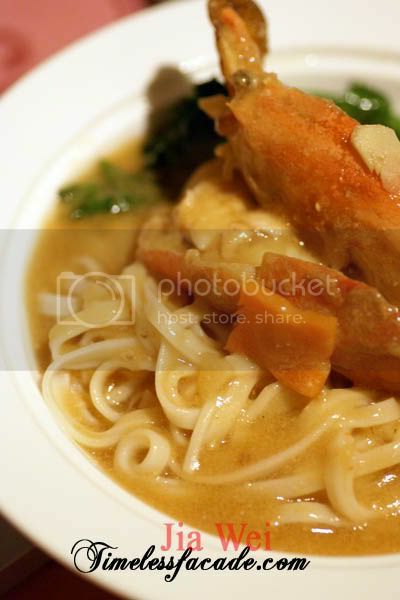 This soup was a tad starchy, almost creamy smooth in texture yet light on the flavours. The fins were of quite a size and came bundled with crab meat, beansprouts and the likes. The lamb was on the original menu but most of us opted to swap it with the spare rib. Fortunately for me, I had the luxury of trying both (with some friendly persuasion of course). 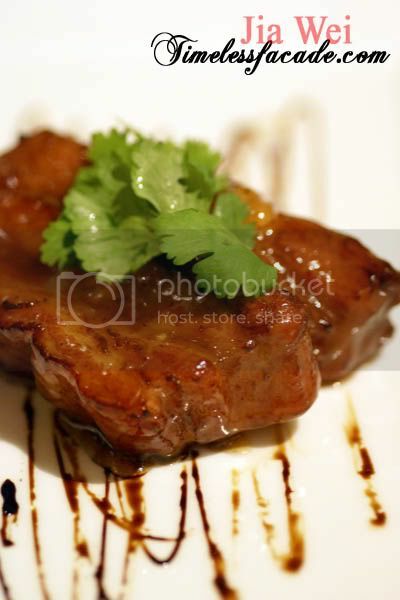 My piece of pork rib was 50% meat, 50% fats, which was a turn off really. I spent more time trying to slice away the fats then enjoying my piece of meat. However my dining companions seemed to have gotten much leaner cuts so I was probably just unlucky. And the special sauce didn't exactly wow me. It was just sweet, probably from some infusion of honey. Surprisingly, the lamb was quite good - tender sans the overwhelming lamb taste that I personally have a disdain for. If only we knew. 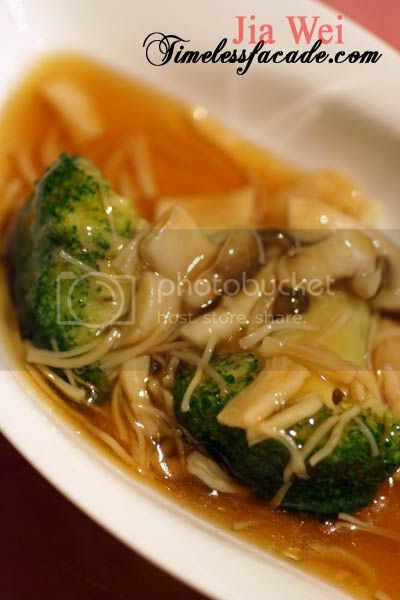 If I didn't know any better, I would have thought that the main focal point for this dish was the broccoli because of the small serving of what looked like Shimeji mushrooms, which brings me to the question - Where are the Bai Ling mushrooms? That aside, this was a very simple dish which offered no surprises. I liked the copious amounts of dried scallops though - salty and adding flavour to a rather ordinary dish. Honestly, this dish just didn't do it for me. The noodles tasted like a thicker version of kway teow and carried some bite but it failed to absorb the essense of the gravy, which by the way, was rather bland. I would have prefered a more robust sauce especially when the prawn, though crunchy and meaty, failed to carry much sweetness in its flesh. Overall a rather average rendition in my humble opinion. I have a low tolerance for extremely sour stuff hence the dessert wasn't exactly my cup of tea. Not that the jelly was sour. On the contrary, it was pleasingly sweet and wobbly of course. It was the lime sorbet that had me cringing with every mouth. What was interesting was the addition of diced apricots and raisins - the first I've seen in such a dessert. Still, a no go for me. 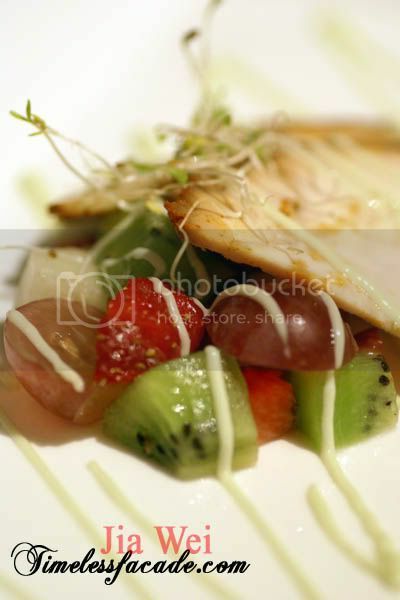 The above Christmas set dinner cost each pax to the tune of $98++, inclusive of a glass of red or white wine. There is a 30% discount if you opt for the set from Monday to Thursday. I would like take this opportunity to thank Grand Mercure, especially Keane, for this invitation. I don't see any Bai Ling mushrooms in the broccoli dish at all. The mushrooms shown are more like shimeji. I think Bai Ling and Shimeji mushrooms look very similar. 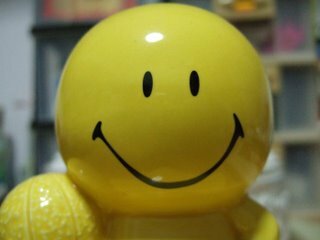 Just that the taste is different. Err... Bai Ling is quite big with a flat head while shimeji is smallish with a small head. They are totally dissimilar. Yea you are right! Sorry I don't really know much about mushrooms. Means they didn't serve the bai ling mushrooms.